The Party Committee and the Executive Board of the Vietnam Social Security (VSS) closely directed administrative reform in 2017 and the first six months of 2018. The Vietnam Social Security sent 47 documents guiding and directing administrative reform in order to guide its subordinate units and local social insurance agencies to perform these tasks and achieved remarkable results. 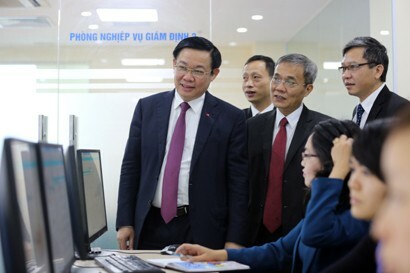 Representatives of the Office of the Government, the Ministry of Home Affairs and the Ministry of Information and Communications affirmed that the Vietnam Social Security is a prime example of applying information technology to administrative reform. Mr Dao Viet Anh, Deputy General Director of the Vietnam Social Security, said that, in 2017, VSS reviewed and simplified forms, and completed processes in all areas like collecting insurance premiums; granting social insurance books and health insurance cards; settling and paying social insurance, health insurance and unemployment insurance to ease works for policyholders and beneficiaries. Specifically, the Vietnam Social Security reduced its administrative procedures from 32 to 28; shortened the time limit for issuing social insurance cards from 20 days and health insurance cards from 7 days to 5 days and re-issuing health insurance cards without any change made to existing information within one day. Besides, the Vietnam Social Security strictly supervised administrative procedures in order to make no more procedures, documents and papers beyond the law. The social insurance sector is presently seriously applying the single-window mechanism at provincial and district level insurance agencies where applications are received from and results of administrative procedure settlement are returned to organisations and individuals; and effectively carrying out electronic transactions to enable enterprises to apply documents around the clock. By June 2018, over 90 per cent of social insurance agencies in the country adopted electronic transactions and all 63 provinces and cities accepted the delivery of administrative documents via public postal services (free of charge for enterprises). In the organisational structure reform, the Vietnam Social Security has reviewed and promulgated regulations on functions, tasks, powers and organisational structures of its subordinated units. At the same time, the Vietnam Social Security has seriously executed the Resolutions of the 6th Party Central Committee (12th term) on continued renovation and reorganisation of streamlined political apparatus in an effective and efficient manner. To raise the personnel quality to meet increasing professional requirements, the Vietnam Social Security has developed and issued some documents on personnel, title principle framework and personnel assessment framework. the Vietnam Social Security has organised professional training for more than 15,300 employees since 2017. On administrative modernisation, the Vietnam Social Security has achieved impressive results. At present, information technology (IT) is applied to almost all major professional activities of the social insurance sector, such as electronic transactions in collecting and issuing insurance cards; electronically superintending expenses for insured medical examination and treatment; digitising archives; and applying financial - accounting software, and document management software to improve administrative performance, reduce the time and costs of settling administrative procedures for people and businesses. These achievements of the Vietnam Social Security have been recognised and appreciated by many domestic and foreign agencies and organisations. The IT application in the social insurance sector has fulfilled requirements stated in Resolution 19 of the Government on major tasks and solutions for better business environment and higher national competitiveness; Directive 24/CT-TTg dated August 5, 2014 of the Prime Minister on enhancing management and reform of administrative procedures in tax, customs and social insurance fields; and Resolution 36a/NQ-CP of 2015 on e-Government. For IT application for service of people and enterprises, the Vietnam Social Security has to date provided 14 administrative procedures at Level 3 and Level 4 with a huge volume of new online documents. The most is over 18.5 million administrative records for the first-time participants and adjustments of social insurance, health insurance and unemployment insurance premiums. The least is 6,000 records concerning information changes on insurance books. The result of online service delivery of the social insurance sector is “very impressive”. The number of administrative procedures fell from 115 in 2015 to 28 as of July 1, 2017 with many methods of receiving administrative documents and delivering results for enterprises to choose, including online transactions and postal services. The online public services of the Vietnam Social Security have enabled social insurance agencies to application forms anytime in the day, even on public holidays, thus helping individuals and businesses save a lot of money for going to insurance agencies, delivering and printing application forms. In particular, it has helped reduce the time of implementing administrative procedures concerning social insurance and health insurance from 335 hours to 45 hours a year. On deployment of information systems and database, the social insurance sector of Vietnam is building and keeping big information systems such as electronic social insurance transaction system, social insurance superintendence information system, household social insurance management and identification system, and approval and payment management system for social insurance, health insurance, unemployment insurance. The electronic social insurance system has been put into official operation since 2015. At present, nearly 500,000 employers nationwide are using it. More than 28.6 million records have been received and settled. The health insurance superintendence information system, launched in 2016, has connected with more than 12,000 medical facilities nationwide, standardised nearly 12 million data concerning drugs, medical supplies and technical services. Helped by the automatic detection system, the Vietnam Social Security turned down more than 10 per cent of claims with a combined claim coverage of VND3,800 billion due to inaccurate information about health insurance cards, wrong level of coverage or replicated claims. This is an effective tool to prevent profiteering and abuse of health insurance funds at some medical facilities, a representative of the Vietnam Social Security emphasised. The information technology system of the Vietnam Social Security was redesigned in 2015 to centralise data. The Vietnam Social Security is issuing electronic social security cards in order to digitise all public services. The Vietnam Social Security is trying to synchronously deploy IT applications to its professional activities and accelerating administrative reform to provide most favourable conditions for people and businesses. Social insurance is ready to share its database with other bodies. However, in this regard, it is necessary to develop a clear and coherent regulation to ensure the most effective sharing and information security. The Vietnam Social Security expects the Ministry of Information and Communications to soon promulgate specific regulations on technical solutions and connection requirements to interlink six ministries and branches assigned to build the national database under Decision 714/QD-TTg and other units in the provision and use of data, and at the same time, to soon develop the National Data Integration and Data Sharing Axis to connect with data integration and data sharing axes of ministries and sectors, including the Vietnam Social Security to ensure data sharing under the architecture of e-government and improve the efficiency of the national cross-sector database.